Summertime can be rough in the South. The hot, humid weather, rainstorms, and bugs can be enough to keep you inside with the AC blasting and your kid's favorite Netflix show on repeat. However, when family is in town, I am always excited (and motivated) to take them around my new city. 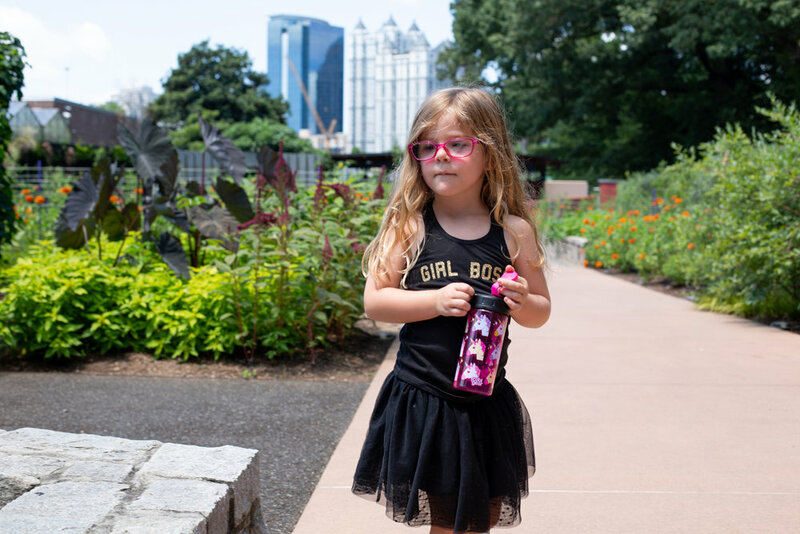 I had yet to visit the Atlanta Botanical Gardens in Midtown and knew it would be perfect for these visitors, and I wasn’t wrong. 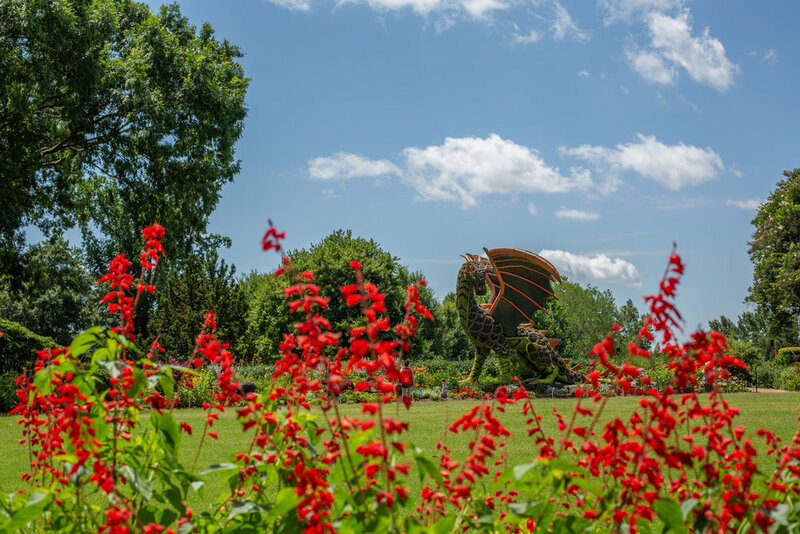 Right now, the gardens have a collection of giant living sculptures throughout the property as a part of their "Imaginary Worlds" exhibit. 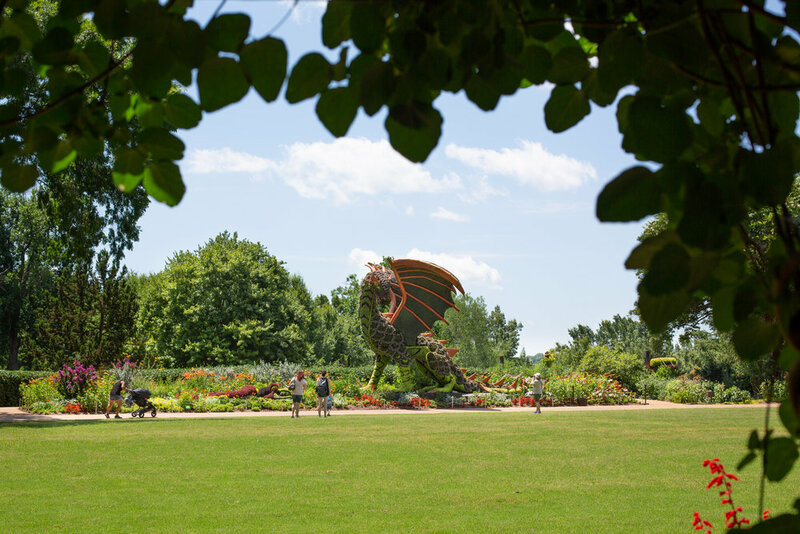 These living sculptures – ranging up to 26 feet tall and 21 feet wide – include an enchanting Mermaid, a gigantic Camel, storybooks, a huge dragon, and much more. The property was beautiful and the skyline views reminded me of being in NYC’s Central Park. 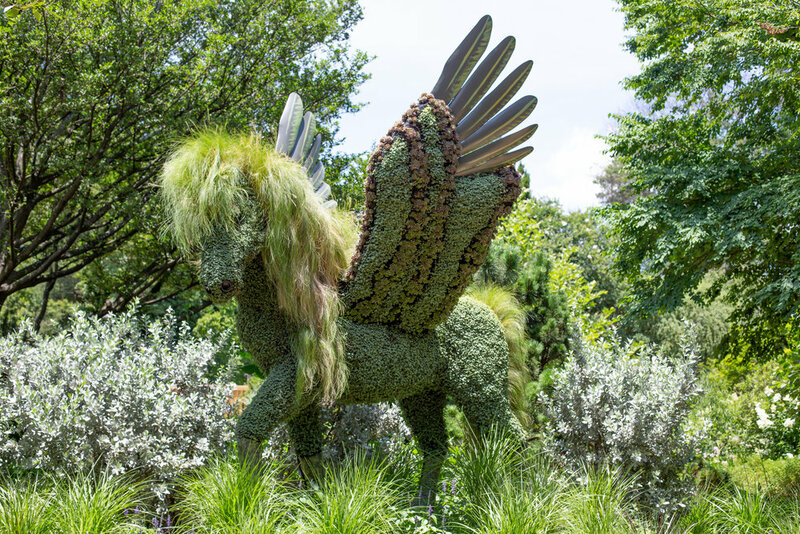 We spent most of our time looking for the living sculptures and in the green houses that were filled with so many beautiful orchids of all shapes and sizes. One was almost the size of my head! I never before have seen such a variety of orchids. They were stunning. The beautiful, unique walkways accommodated my tandem Graco double stroller for the most part. We went on a Friday just after 10 a.m. to avoid the summer heat. It was busy with a few camp fieldtrips, but overall not too crowded. I overheard a couple talking about the last time they visited on a weekend and how it was much more crowded. So, plan a visit on a weekday if you can, and if it's summertime arrive when they open at 10 a.m. to avoid the heat. We walked around and had lunch at the onsite restaurant. The food was fabulous and they had a variety of coloring sheets to keep my four year old entertained. After lunch, we tried to walk around some more but the heat was getting the best of us, so we headed out and made one last stop at the gift shop. Surprisingly, that was also fabulous! They had many unique gifts and some nice home décor. They also had some great kids’ stuff and fun educational books. One thing we did miss somehow was the kids' garden. I was bummed about this since I'm sure Caroline would have loved it. Even more reason to go back when it cools off in fall! 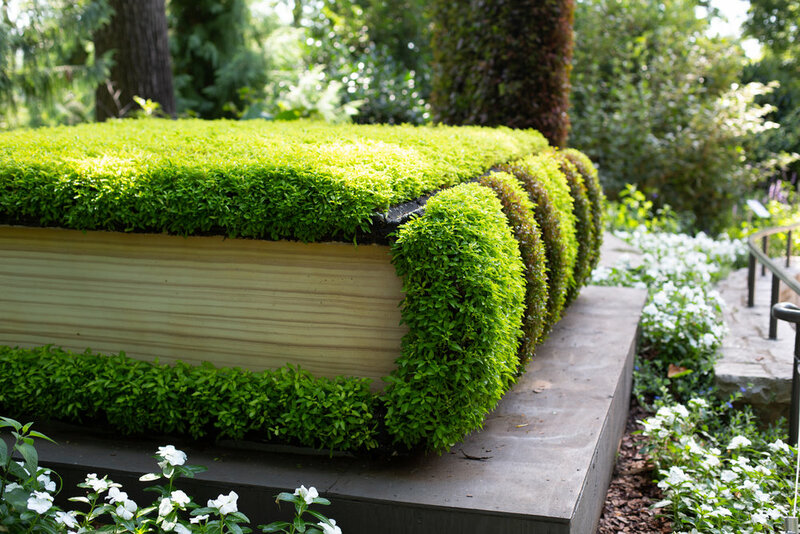 They have several themed events throughout the year and host a "Cocktails in the Garden" event Thursday evenings. During winter holiday season, they decorate with Christmas lights, one of my husband’s favorite things, so I plan on taking him and the girls this year since he couldn't join us for our first visit. 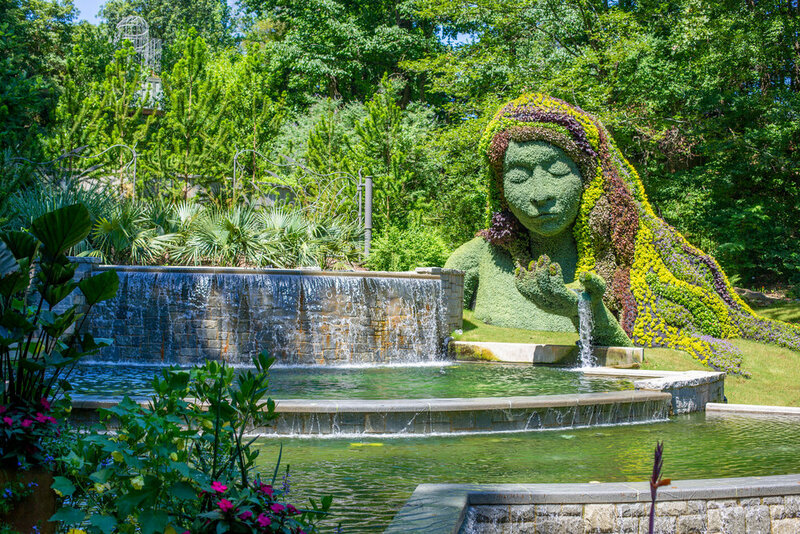 The Atlanta Botanical Gardens is on our list of must sees if you are planning a family trip to Atlanta! We love our new city and cannot wait to explore more of its awesomeness and share it with you all. Photographer tip: Come ready to shoot! 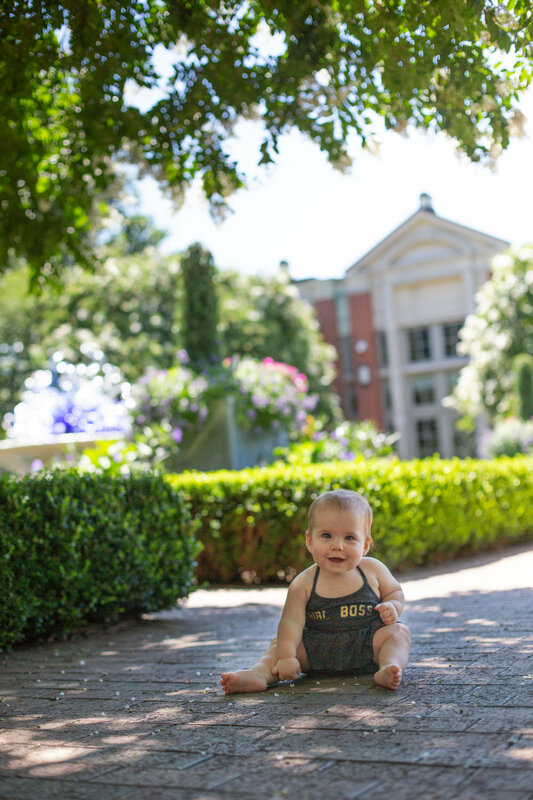 Their bridge, canopy-covered walkways, and city backdrops make this a perfect destination for photographing your little ones OR to do your next family session.